"I don’t want to be too pushy but I do want to do more coaching. How do I strike that balance?" The experiences of both these teacher-turned-coaches highlight an issue we see in districts across the country. 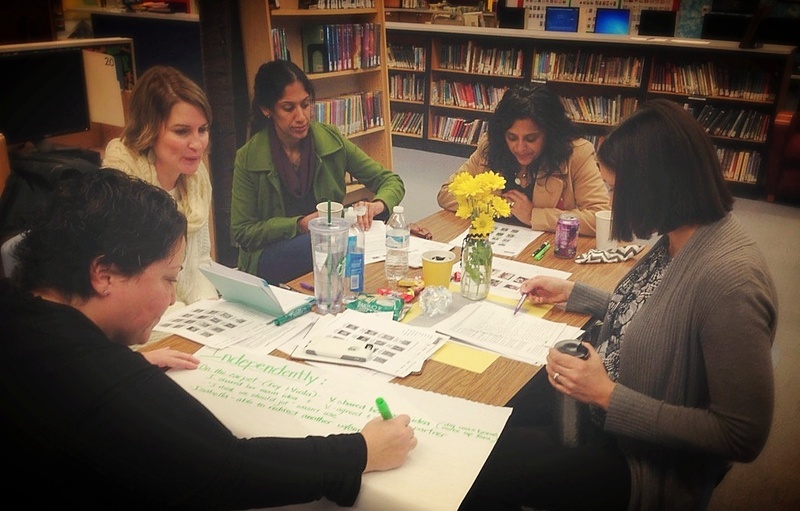 As teachers become coaches, they have lots of questions about their new practices. The work of coaching teachers is complex and requires specific skills — often different skills than those needed for teaching students. For several decades, school districts have been turning to teachers as critical players in supporting other teachers’ learning. Teachers have always played this role in informal ways, but more recently this practice has been formalized and teachers may be finding themselves officially designated as “coaches” (content coaches and instructional coaches are the most common). Coaches are neither administrator nor classroom teacher and may have to navigate new peer-to-peer dynamics while they learn a new skill set around coaching and leadership. Of course, having teachers support other teachers in their learning makes a lot of sense. They have credibility as effective educators, and rich knowledge of instructional practices, and they understand the day-to-day reality of teaching. Plus, coaches can offer individualized support where teachers need it — in their classrooms with their students! But as Rebecca’s and Cheryl’s questions show — and research confirms — coaches can also find themselves in a complicated position. They are neither administrator nor classroom teacher and may have to navigate new peer-to-peer dynamics while they learn a new skillset around coaching and leadership. In Coaching: Approaches & Perspectives, Jim Knight defines coaching as “intensive, differentiated support to teachers so they are able to implement proven practices." To set new coaches up for success, district and school leaders need to put in place clear structures and expectations that allow them to have an impact on teacher practice. Our experience from supporting coaches and helping districts implement new coaching programs has taught us a few key lessons that district and school leaders should keep in mind when they embark on the journey. Coaches are a powerful lever for supporting teachers’ ability to address questions about student learning. Coaches may for instance talk to teachers about their goals for student learning and then observe specific students in the classroom, or help teachers analyze student work and make decisions about the next day’s lesson. Sometimes this is a first step for teachers working with coaches — and student learning plays a critical role throughout coaching. Evidence of student learning and student learning challenges provide direction and focus for coaches and teachers in their work together. Coaches work most effectively when they support a clear set of instructional practices. For instance, you may expect your coaches to help teachers differentiate their instruction for English-language learner (ELL) students. Ideally, coaching is one professional learning structure among others (workshops, PLCs) — all contributing to a larger strategy for supporting teacher learning aimed at the same goals. Without a focus, coaches can feel at a loss about what to do as they start to support individual teachers. A coach’s role can feel ambiguous and undefined without specific parameters in place. How will coaches work with the principal? How should a coach’s day go so that they spend as much time as possible coaching teachers? Which teachers will they be supporting and for what specific purpose? As a district or school leader thinking about launching a coaching program, make sure you think through the details with your colleagues. We recommend involving coaches and teachers in this decision-making process and communicating along the way. In some districts, for example, coaches start out by supporting new teachers. While this is a great idea in many ways, there is a danger that other teachers may think only new teachers need support in fine-tuning their instruction. For maximum success, everyone in leadership roles in a district should learn to describe the roles of coaches, how they support district work and what this means to the teachers. Principals can share this at staff meetings and one-on-one with teachers. District leaders may communicate this through printed or electronic messages or with principals and principal supervisors in their meetings. As I have mentioned, coaching is its own practice and it is complicated. Coaches face a steep learning curve in their first few years. We recommend job-embedded professional development so coaches can observe and learn from each other as well as from experienced coaches from outside the system. Coaches also benefit from opportunities to collaborate with each other to troubleshoot and share successes. So how did the two coaches we heard from at the beginning of the post approach their challenges? After a day of focused collaboration with another coach and me, both coaches could apply what they were learning in the larger professional development sessions to their specific school context. Rebecca helped a first grade teacher organize her classroom to provide one-on-one support for her emerging readers. She learned that she could maintain her informal, friendly style with teachers while also helping them grow their instructional practices to meet their specific goals. Teachers appreciated her deep instructional knowledge and how she applied it to their specific questions. Cheryl was able to support a second year teacher’s existing efforts to teach focused writing lessons to her fourth grade ELL students by increasing intentional modeling of her own decisions as a writer. To do this, Cheryl gathered evidence of student strengths and needs in the classroom and shared these with the teacher. Her a-ha moment: By keeping student learning as the focus, she could work with a teacher to quickly analyze student work and plan for responsive, intentional instruction. Both coaches built on the strengths of teachers to create powerful learning for students. Coaching has come and gone in some systems and is coming for the first time in others. Teachers need to learn new practices to better meet the needs of their students. Coaches can be a powerful factor in this learning — as long as they themselves get the right support. Clarity, communication and focus at the school and district level can ultimately set coaches up for success in their role.